Although the Maytag was not my first choice for a dryer, this dryer is exactly what I was looking for. It has the IntelliDry ® sensor. I shopped around all the name brand dryers and the moisture sensor dryers where outside my price range. 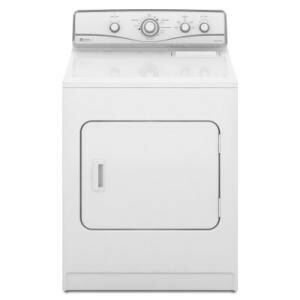 The Maytag Centennial was the same price as smaller capacity dryers without the moisture sensors. I have used the dryer for a week now and it works great. The sensors are accurate. It also has a wrinkle prevention option and buzzer you can turn on or off. The large tub allows large loads to toss freely. Towels dry quickly and sheets in minutes. The dryer came with a drying rack but I haven’t had an opportunity to use yet. The Maytag is very quiet. My laundry room is away from the family areas of the house but I could still hear my old dryer running. If the buzzer is set to off on the Maytag dryer, I have to walk to the laundry room to tell if it’s still running. So far we have been very pleased with our purchase. I can’t wait for my washer to go out so I can get the matching washer from Maytag as well. We bought a matching washer-dryer set and it sticks out at least 6 inches farther from the wall than the old one. The vent opening is lower than our old dryer and we cannot lower the wall opening. If the dryer is pushed farther back the flexible hose kinks. The old dryer had an open base that would allow the hose to curl underneath before attaching to the wall outlet. This is a major problem since our we go through the laundry room to the garage. Now the door barely clears the dryer and coming in with an armload of groceries is a big hassle plus it looks awful. I am hating this machine more every day!!! I agree with the other responder, the lint dryer is in a dumb place - I stack folded clothes on top while doing laundry and the lint trap is in the way. Also, the door handle is ergonomically incorrect - you have to turn your wrist to grab the handle and then only with the tips of your fingers. Someone with arthritis would have a hard time opening the door. I bought my dryer a about 10 days ago, but only hooked it up last week end. At first it took 3 cycles to dry. I have seen this same comment about this dryer. It was only on a 120 current. We bought the correct outlet, hooked it up again and magic! I was a happy camper! This is one great dryer. It really has a large capacity tub, if you need that. As others mentioned, my one minor complaint is "I do not like the lint trap location". I am used to pulling it from the inside of unit, not the top. This dryer is quiet enough for me, don't need a whisper. You could hear my old dryer from 2 doors over. I held on to that one till it started smoking. I bought This Maytag Centennial dryer in August of last year from Sears. I had been renting so long it simply made sense to finally break down and buy one. I researched heavily since I first off hate to buy things more than once and secondly I hate having washers and dryers destroying my clothes. - Handles all types of loads with ease. - Very quiet, but not whisper quiet. This is hardly a negative since it?s quieter than the majority of dryers I have heard at other people?s houses. I just have a 1 bedroom so I would love it to be totally silent.useless at first but it actually work quite well. I usually have a lot going on so I don?t always get to the clothes, the wrinkle prevent my shirts from getting wrinkled saving me ironing. the other option i thought would be useless was the delicates. I tend to dry clean my dress shirts and pants, but I now live with my girlfriend, and well she has delicates that apparently the dryer handles well. The other feature that I had to have was the shoe drying rack. There is a rack that goes into the dryer that allows you to set shoes inside the dryer without having them rolling around making tons of noise.